Finlandia University’s International School of Business is now a Certified Global Business Professional (CGBP) Educational Partner School. CGBP is overseen by the National Association of Small Business International Trade Educators (NASBITE), a leading authority and industry standard for global business, education, trade credentialing, training and practice. Alumna Laura Bianucci is set to present on the topic of networking at the next A Taste of Success on Tuesday, April 16 in Mannerheim Central from 12 to 1 p.m.
Bianucci is a 2013 graduate of FinnU’s marketing program. She has held a few positions since graduation, but currently works as a recruiter for the Advanced Welding Institute in Eagle River, Wis. Bianucci is also a member of the Finlandia Alumni Board. 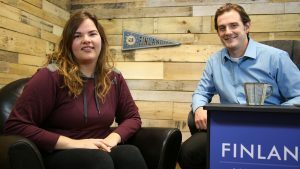 Finlandia University’s 2019 graduating class will hear from marketing major Haley Makela during this year’s commencement ceremony as the local student was selected as Student Representative. Makela has succeeded in and out of the classroom, all while being a dual-sport athlete in basketball and soccer. This week on Finlandia Fridays, accounting instructor Laura Sieders stopped by to talk about the accounting degree offered here at FinnU. Finlandia University is thrilled to welcome Juha Vidgren, Chairman of the Board, Ponsse PIc,, to campus. Vidgren has been on the board of Ponsse since 2000, and with the company since 1998. Vidgren will be giving a presentation at the Finnish American Heritage Center on Wednesday, February 13 at 3 p.m. The presentation, titled How a one man operation in rural Finland became a global leader, will center around the idea of what anyone can accomplish if they apply themselves. Below is an article from the Fall 2018 Donor Edition of the Bridge. See more articles from this edition of the bridge and see a full archive of past issues by visiting finlandia.edu/thebridge. As a student at Finlandia University, Jamie Thyrion (‘08) balanced raising an infant son, working a part-time job and tutoring other students while working toward her business degree. Make that work takes sisu, and there’s no shortage of it for this exceptional FinnU graduate. Once again, Ponsse and Finlandia University are pleased to announce an exclusive internship position for a Finlandia University student at Ponsse North America in Rhinelander, Wisconsin (approximately two weeks) and Ponsse Plc headquarters in Vieremä, Finland (approximately three weeks). This paid internship will enable the student to learn first-hand about Ponsse, its operations, and the forest industry both here in the USA and in Finland. Finlandia University is happy announce the latest new and improved academic program page. 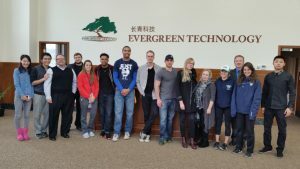 The Accounting program page features more visuals and less text, and is geared more toward incoming and prospective students who are looking specifically at FinnU’s accounting program. 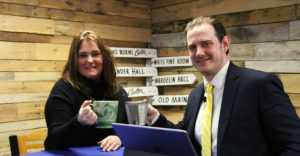 The page showcases faculty and alumni interviews and highlights the unique aspects of the program such as the versatility of an accounting degree, personalized internships and experienced accountants leading the classroom. Laura Sieders never planned on becoming a college instructor. The Calumet native moved to Washington D.C. shortly after graduating from Michigan Tech with her bachelor’s in business administration and a focus in accounting. Starting this fall, she’s a full-time faculty member at Finlandia University in the role of Instructor of Accounting. Finlandia University is happy to welcome Paul Werner as its new Assistant Professor in Marketing in the International School of Business. Travis Cornwell (’18) calling a Finlandia University men’s hockey game during his internship with 99.3 The Lift. The Knowledge Review, an international education magazine for universities, students, teachers and parents, named Finlandia University one of the Top 10 Best Institutes for a Career in Sports and Athletics 2018. Non-athlete careers in athletics can range anywhere from sports marketing and sales to physical therapists and trainers. FInlandia University is pleased to welcome Laura Sieders and Paul Werner to their new positions in the International School of Business. Sieders, who has served as FinnU’s Adjunct Professor in Intermediate Accounting for the past two years, will become the new Instructor of Accounting. 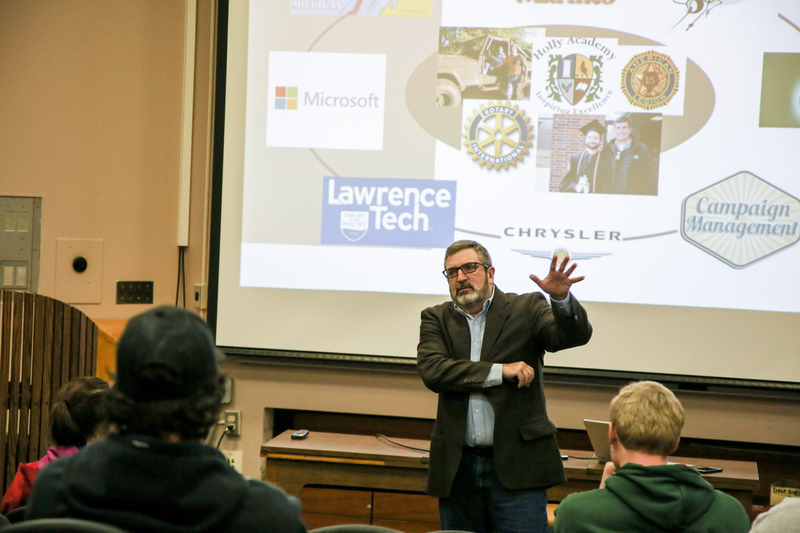 Werner will be the Assistant Professor in Marketing. Both will begin in their new roles in August. Registration for fall and summer classes is now underway for all students. Your first step is to see your academic advisor to get your PIN. This will allow you to sign up for classes online. In addition, you will need to clear any holds that may be on your account (billing, financial aid, admissions, etc.). Where can I find information on the registration process? 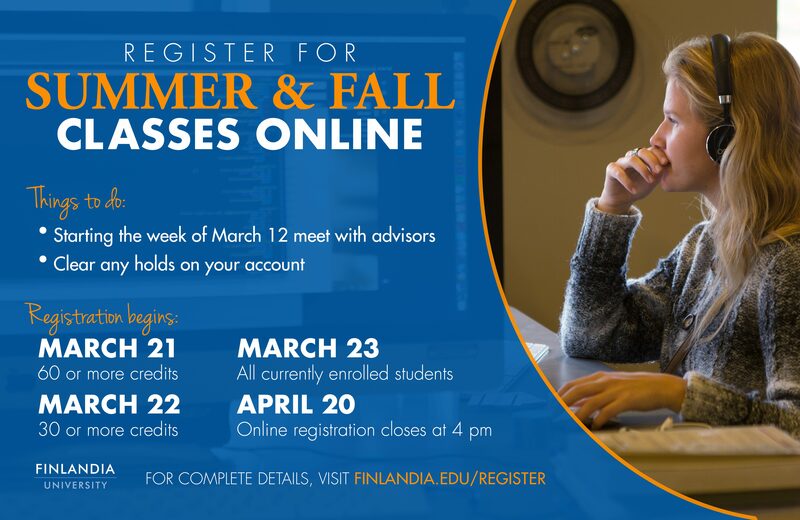 All information regarding class registration can be found online at finlandia.edu/register. The annual Portage Health Foundation Scholarship opportunity for Finlandia University students studying healthcare and coming from Houghton, Keweenaw, Baraga or Ontonagon counties is now accepting applications. Finlandia University is proud to announce its Fall 2017 semester Dean’s and Honors List Students. In total 101 students earned a recognition, including 60 who earned a spot on the Dean’s List for having a Grade Point Average of 3.75 or above. Senior marketing major Kyle Niemi stopped by Finlandia Fridays this week to discuss his internship with Finnish mobile mentoring company Mesensei. Tuukka Ylälahti, the creator of Mesensei, was in an earlier episode this season, where he previewed the app and his inspiration behind it. 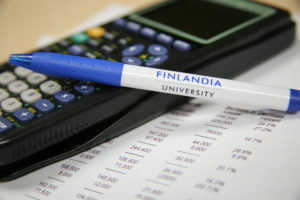 A unique partnership between Finlandia University and JAMK University of Applied Sciences, Finlandia offers Finlandia students a great discount on tuition during the summer 2018 semester. The program includes the opportunity to study abroad while earning credits and exploring all Finland has to offer. 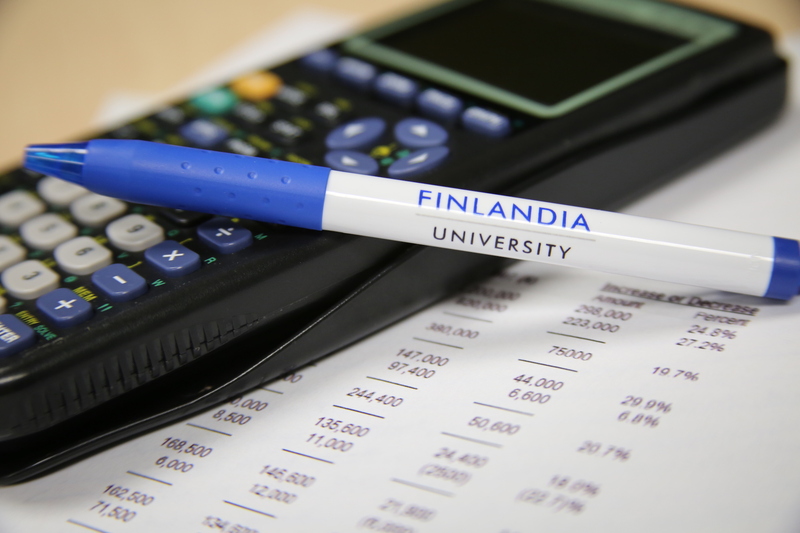 The Finlandia University International School of Business is offering a one-credit course titled BUS206 Accounting Software for Small Business on Tuesday evenings beginning March 13 from 6:10 – 7:40 p.m. The course is open to community members for $75. 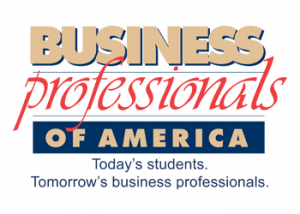 Finlandia University’s chapter of Business Professionals of America is hosting Business Professionals of America Day on Wednesday, February 14 with a full day of activities for Upper Peninsula high school and college students. RSVP to the event on Facebook (not required) to receive updates as the event nears. Paloheimo Fellows Class of 2018 from left: Gina Geliche, Dana Pakulski, Dr. Hilary-Joy Virtanen and Monica Freeman. 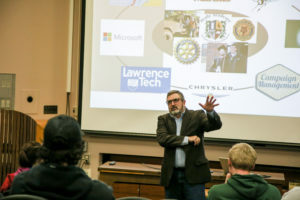 The inaugural first semester of the new Finlandia University Business Professionals of America (BPA) has been a busy one. 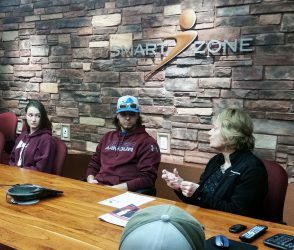 In addition to all of the tasks involved in launching a new organization, the club still found time to host guest speakers and make a visit to Somero Enterprises. 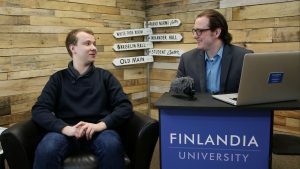 Tuukka Ylälahti stopped by Finlandia Fridays this week to talk about his revolutionary new app Mesensei. Ylälahti is the co-founder of Mesensei, a startup company working on “mentorship programs in support of learning, entrepreneurship and social inclusion.” The program and Ylälahti have visited various universities in America to see how the program would do in the American market. With close ties to Finland, Finlandia seemed like the obvious choice to lay some ground work. Finlandia University’s mobile mentoring project with Finnish app developer Mesensei will kick off with a workshop on Wednesday, October 25 from 6 to 9 p.m. in the Finnish American Heritage Center. This event is free and open to the public. The workshop will provide insight on the different uses of mentorship in support of teaching, career services, alumni relations, and fundraising, based on case studies and experiences from Europe, Asia and Canada. Beginning in November, Finlandia students and alumni will be participating in an innovative pilot-project utilizing a mobile mentoring application developed by the Helsinki-based Mesensei – a leader in education technology. The project is expected to last three months during which time between 20-40 student-mentor pairs will utilize the application and give feedback on its features and usability as a mobile mentoring platform. Jason Aldrich (’11) was recently introduced as Equipment Manager and Strength Coach of the American Hockey League’s Iowa Wild, minor league affiliate of the National Hockey League’s Minnesota Wild. Aldrich is a 2011 graduate of Finlandia’s Sports Management program, and played for FinnU’s NCAA Division III hockey program. The organizing committee for the Finlandia Business Professionals of America (BPA) chapter: (Left to right) Logan Moore, Niami Shepeard, Kyle Niemi, Nathan Perreault, Amelia Carusi, Haley Makela, Samantha Richards and Tyler Borkadi. Perho College lecturer Leni Palminkoski-Pihlamo presents on family history in the Copper Country and the Perho Culinary, Tourism and Business College. For many students, summer is just as important of a time of learning as the school year is. That includes sophomore Ryan Bain, who is completing an internship at Lac Vieux Desert Health Center Chiropractic. Below is an article that was posted in Wiindamaagewin, Lac View Desert’s bi-monthly eNewsletter. It has been reposted with permission from LVD Tribal Communications. This month’s Finlandia University alumni success story is focusing on Carley Saint-Onge – a graduate of Finlandia’s International School of Business. Saint-Onge is now working in marketing for Texas Instruments in Dallas, Texas. In this question-and-answer session, she talks about the world of small schools compared to big schools, digital marketing, business-to-business marketing compared to business-to-consumer marketing, what it was like to move to a new region and what she remembers best about her time at FinnU. 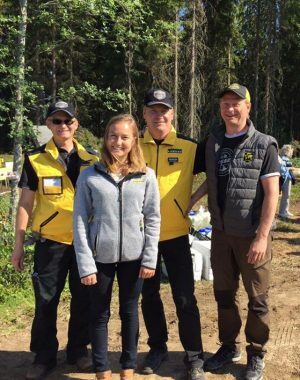 For the third year in a row, Finlandia University and Ponsse, one of the world’s leading manufacturers of forest machines for the cut-to-length method, have partnered for to offer the Ponsse Einari Vidgrén Foundation Internship. The internship includes a couple weeks working in Finland. This year’s student is Nathan Junttila. Below is a story originally published in PONSSE NETWORK BULLETIN. It has been reposted with permission. Finlandia University is happy to welcome Darren Bausano to the university’s family. Bausano is serving as the Administrative Assistant for Suomi College of Arts & Sciences and International School of Business. From left – Theresa Wolf, Aoi Buto and Pavel Kuzmin. This spring’s graduating class really puts the International in the International School of Business (ISB) at Finlandia University. Receiving their BBA on April 30 will be three very special students: Aoi Buto, Pavel Kuzmin and Theresa Wolf. Students from the Finlandia University International School of Business were recognized during a luncheon on Thursday, April 13, 2017. The intimate luncheon was hosted at the Jutila Center. Students, faculty, and staff from the school gathered to celebrate the accomplishments of the seniors, including recognizing Walker Enstad and Schwartzen Jarmond as co-Outstanding Seniors. Several photos from the event are available below, additional photos from the event are on the Finlandia University Facebook page. Team SISU (from right to left): Paul Porras (team mentor), Andrew Martin, Sara Martin, Katelyn Anderson, Ginger Connin (team mentor), Jenna Ollanketo, Schwartzen Jarmond. 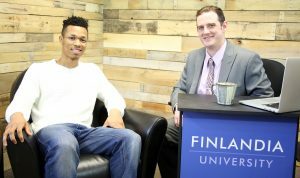 This week on Finlandia Fridays host Michael H. Babcock is taken on a reminiscent adventure as management and entrepreneurship student Schwartzen Jarmond looks back on international study opportunities presented through Finlandia University. Schwartzen Jarmond (second from right) at the Näsinneula tower in Tampere, Finland with exchange students from the Czech Republic and France. 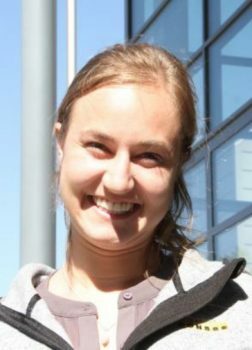 Kirsten Berg, an accounting major from Hancock, is looking forward to completing her BBA this fall semester. 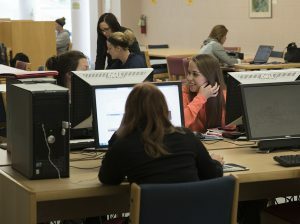 Although she is still busy finishing her courses, she has already found employment with the Michigan Tech Employees Federal Credit Union in Houghton. Kirsten has accepted a job as an accountant and will be following a career path to transition into the Manager of Accounting and Finance for the MTEFCU. This installment of Finlandia Fridays features a local student by the name of Samantha Richards who transferred into Finlandia from a larger institution. Richards, a Dollar Bay alum who is majoring in accounting, was asked to be apart of this week’s episode because of one of her latest Instagram posts. 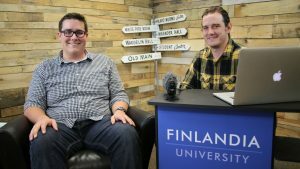 “This post was touching to some of the staff at Finlandia,” said Michael H. Babcock, host of Finlandia Fridays. The ability to build a personal and professional network is a vitally important skill that is rarely taught in business schools. According to a study by the Adler Group, 85 percent of all jobs are landed via networking. In addition, the contacts made through networking can be valuable connections later on in one’s career. First year ISB student Bryan Matheson meets with Randy Heinonen, owner of Superior Claims Adjusters, during Tuesdays Networking Workshop. Ready to travel to Finland? How about Ireland? Or South America? You’re only a college student once, and now’s your chance to study abroad! Finlandia University students are invited to learn about all of the study abroad opportunities available to them on Tuesday, October 4 from noon to 1 p.m. at Mannerheim Central during the annual Study Abroad Workshop. 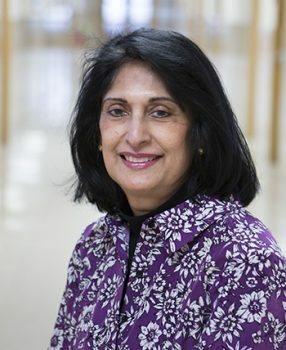 Associate Professor of Marketing Rekha Ambardar is known around the literary community for the many publications, presentations and workshops she’s hosted. The summer of 2016 was another busy one for her. Locally, she conducted a fiction writing workshop on pacing in fiction for Copper Country community members at the Portage Lake District Library in June. 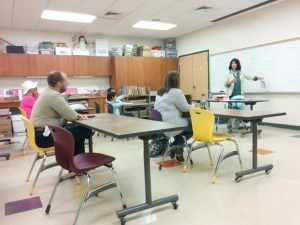 Associate Professor of Marketing Rekha Ambardar teaching a class at Portage Lake District Library in the summer of 2016. 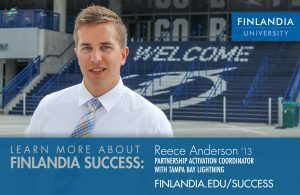 ALUM Reece Anderson (’13) Major: Sports Management Graduation Year: 2013 Hometown: Hancock, Michigan Current Location: Tampa, Florida Job: Partnership Activation Coordinator with Tampa Bay Lightning What was your career path to get to where you are now? International business major Dean Burggrabe (left), International School of Business Dean Kevin Manninen and marketing major Walker Enstad pose for a photo in Finland at JAMK University in June 2016. One of the desired learning outcomes for Finlandia University graduates is to develop a global perspective in order to better understand and operate in today’s world. This summer, two International School of Business (ISB) students are doing just that as they study abroad in Finland. Finlandia University is proud to have once again have a student from the International School of Business interning with Ponsse Corporation in Finland. This year’s intern is junior Sara Martin, a business management major who also plays on Finlandia’s hockey team and serves on Student Senate. A unique partnership between Finlandia University and JAMK University in Jyväskylä, Finlandia offers Finlandia students a 50 percent discount on tuition during the summer 2016 semester. 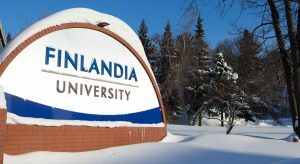 The Finlandia University Board of Directors approved a Bachelor of Business Administration in Marketing and Graphic Design. The new academic program was created collaboratively between faculty in the university’s International School of Business (ISB) and International School of Art & Design (ISAD). It will begin accepting students immediately. As the world has globalized, more small- and medium-sized businesses have the potential to do business internationally. Many are already there. However, many of these companies also lack the expertise needed to operate successfully in the global marketplace. With a Bachelor of Business Administration (BBA) in International Business from Finlandia’s International School of Business, you’ll have the advantage you need to land a job in a crowded marketplace. Below we lay out the reasons why. 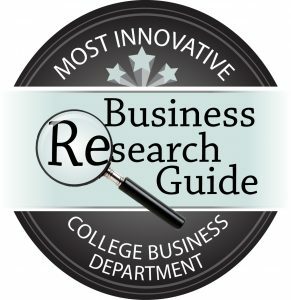 Finlandia University’s International School of Business has been ranked among the most innovative small college business departments by Business Research Guide. The ranking was published on the organization’s website in September. Business Research Guide selected and ranked the top 50 from among the qualifying programs. Finlandia University was ranked 25th. 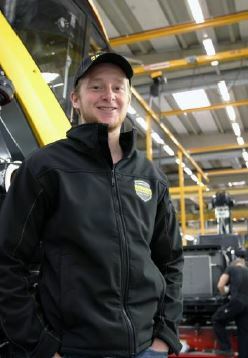 Micah Laban from Finlandia University, Michigan, USA is completing his Ponsse internship in Vieremä. Einari Vidgrén Foundation granted scholarship to Finlandia University in May 2015. Baraga-native Elizabeth Bruett who earned a perfect 4.00 this spring during her final semester. Finlandia University is proud to announce that 115 students have earned dean’s or honors list recognition because of their impressive academic achievements during the spring 2015 semester. That includes 78 students on the dean’s list with a grade point average (GPA) of 3.75 or above, and 32 who earned a perfect 4.0 GPA. 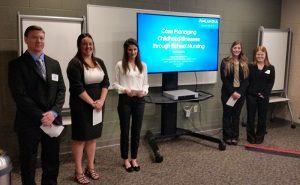 For the first time this year Finlandia University is participating in THE Project, a project management competition sponsored by the Western Michigan Chapter of the Project Management Institute. 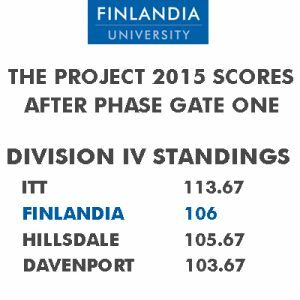 The first phase was completed in late February with Finlandia scoring the second most points in its division. “What a great experience this is for our students to be competing against other universities in a state-wide competition.” said Kevin Manninen, dean of the business school. For Jordan, Finlandia offered the perfect mix of everything he needed: A place to grow his entrepreneurial spirit, while continuing to play the game he loves. Plus, he’s less than two hours from home, meaning visiting his family, or making a quick trip to the hunting camp, are options whenever he wants to. In his first semester, he realized the Finlandia experience was something special. He spread the word, and this semester, his brother joined him. 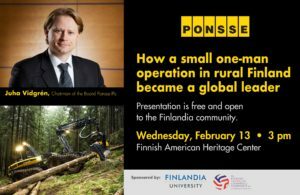 Today international business leader Juha Vidgrén of Ponsse presented at the Finnish American Heritage Center. Finlandia’s Live Twitter account was on site, and Tweeted some of Vidgrén’s better points. Below is a recap of the presentation, feel free to add your favorite part of the presenation by tweeting at @FinlandiaLive. Finlandia University is proud to announce its fall 2014 dean’s and honors list. The list includes 131 students, highlighted by 26 who earned a perfect 4.00 grade point average (GPA) during the semester. HANCOCK –Finlandia University is pleased to recognize its students who, in the Spring 2013 semester, earned grade point averages from 3.50 to 4.0. The Dean’s 4.0, Dean’s, and Honors Lists include students who completed at least 12 credit hours in the Spring 2013 semester. Finlandia University faculty and staff congratulate these students on their academic achievements! HANCOCK –Finlandia University is pleased to recognize its students who, in the Fall 2012 semester, earned grade point averages from 3.50 to 4.0. The Dean’s 4.0, Dean’s, and Honors Lists include students who completed at least 12 credit hours in the Fall 2012 semester. Finlandia University faculty and staff congratulate these students on their academic achievements! HANCOCK –Finlandia University is pleased to recognize its students who, in the Spring 2012 semester, earned grade point averages from 3.50 to 4.0. The Dean’s 4.0, Dean’s, and Honors Lists include students who completed at least 12 credit hours in the Spring 2012 semester. Finlandia University faculty and staff congratulate these students on their academic achievements! 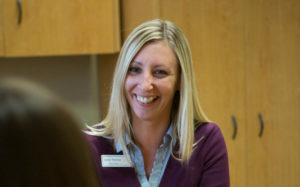 HANCOCK –Finlandia University is pleased to recognize its students who, in the Fall 2011 semester, earned grade point averages from 3.50 to 4.0. The Dean’s 4.0, Dean’s, and Honors Lists include students who completed at least 12 credit hours in the Fall 2011 semester. Finlandia University faculty and staff congratulate these students on their academic achievements! 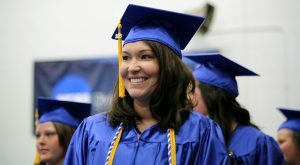 HANCOCK, MI –Finlandia University is pleased to recognize its students who, in the Spring 2010 semester, earned grade point averages from 3.50 to 4.0. The Dean’s 4.0, Dean’s, and Honors Lists include students who completed at least 12 credit hours in the Spring 2010 semester. 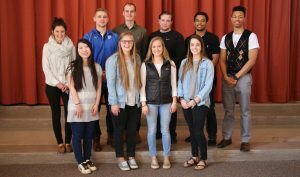 Finlandia University faculty and staff congratulate these students on their academic achievements!